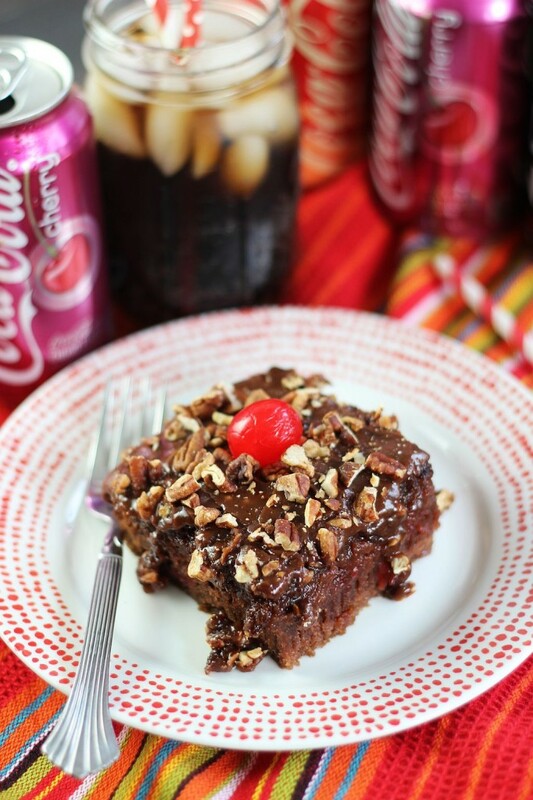 Not your average chocolate cake, this special cola chocolate cake features Cherry coke for extra an punch of flavor, and a sweet and decadent cola glaze! March is all about basketball. Well, and the fact that spring is finally here. That ranks high too. I’m personally more of a football person, if I’m being honest, but lately I’m surrounded by basketball fans. They come out of the woodwork this time of year. Everyone’s rooting for their fave team. My S.O. is also much more into football, but his alma mater was having an excellent basketball season, and so he was following along pretty closely and cheering for them to keep winning. Alas, it did not work out that way. He’s kinda bummed, but maybe next year! 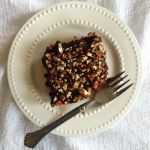 With everything being about NCAA® March Madness, I wanted to throw together an easy dessert to enjoy while we have friends over to watch the big game. We can cheer on our favorite teams and eat cake. Cake and sports go hand in hand, don’t you know? Sweet treats while catching the big game are a must. I was ecstatic when I was grocery shopping this weekend and saw the Cherry and Vanilla Coke flavors!! Gah! I love the Vanilla. It’s my all-time favorite one and I was so excited to see it again! 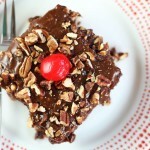 I decided to use the Cherry Coca-Cola in a classic chocolate cake recipe that I have. It turned out so well that I’m really tempted to make it again using the Vanilla flavor too. This cake is really special. 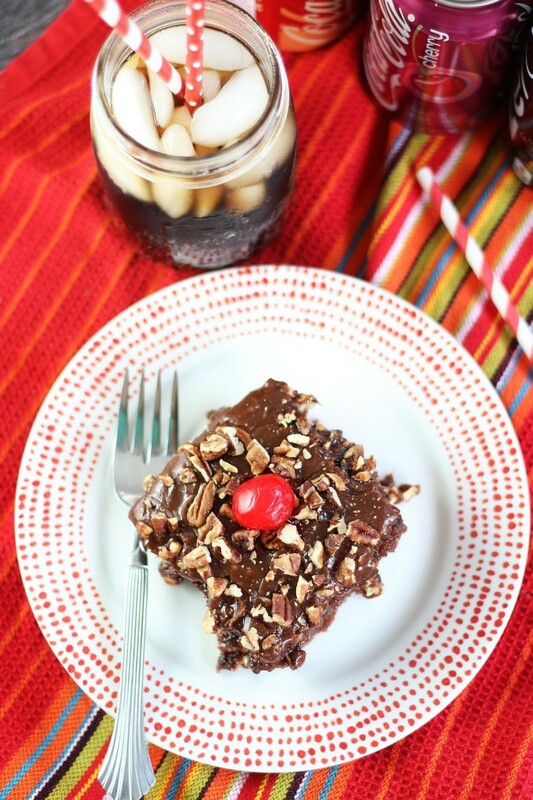 The addition of cola makes this seemingly plain ol’ chocolate cake just…. way more interesting and so much more flavorful. 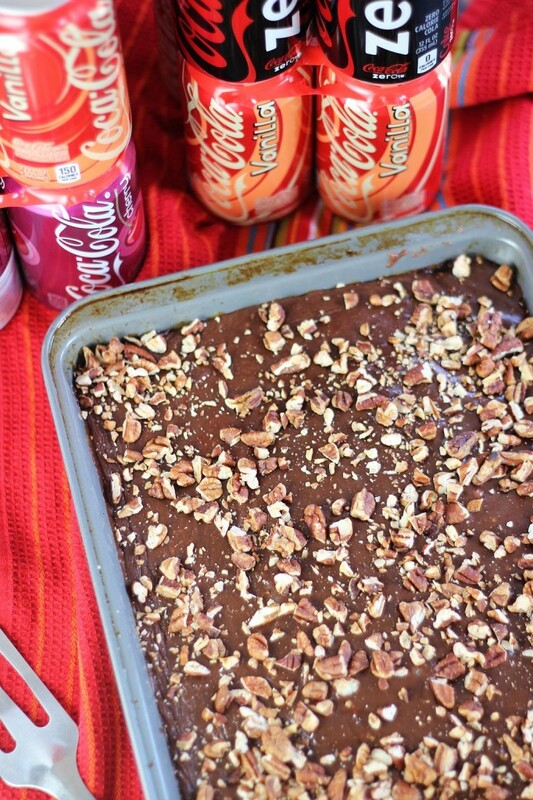 You would be surprised at the impact that the Cherry Coca-Cola has on chocolate cake. I mean, besides the cherry flavors. Who doesn’t love cherry and chocolate together? That part is wonderful, but it’s more than that. 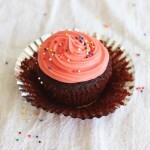 There’s more depth and richness even to the chocolate flavors, thanks to the Cherry Coke! And the glaze!! This cake is so incredibly moist because the glaze seeps down into the cake making it all gooey and amazing. To top it off, toasted pecans as a garnish add a buttery and nutty crunch. 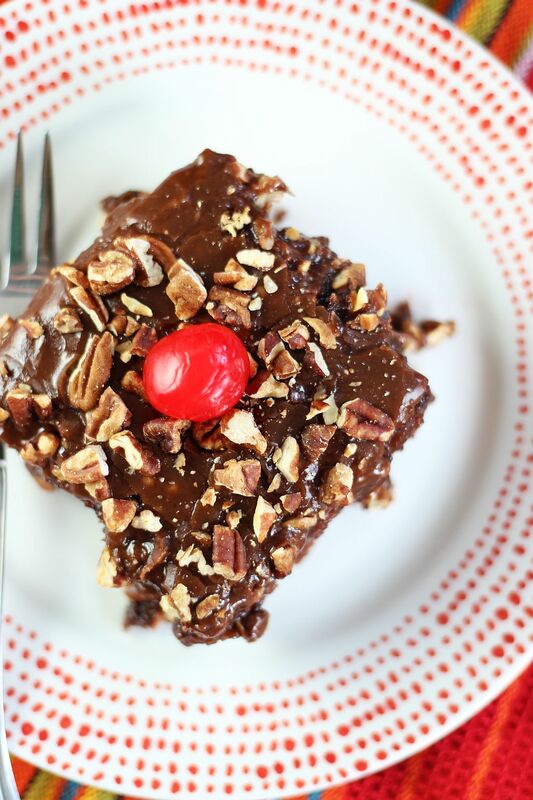 Pecans have that way about them – they instantly improve everything. Even something that needs no improvement. I don’t know a dessert where pecans don’t have that effect! 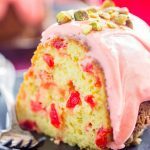 I’ve served a similar cake many times before and it’s always a hit! I know this one will be well-received too. It’s a no-fuss dessert that will definitely be a crowd-pleaser. 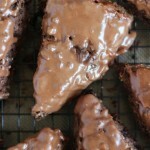 It’s decadent, but easy to make! If you’re having friends over to watch basketball through the rest of March, you can’t go wrong with this stunner! Combine the Cherry Coca-Cola and buttermilk in a small bowl, and set aside. In a large mixing bowl, beat butter and sugar. Gradually add the eggs, beating at low speed. Combine the flour, cocoa, and baking soda. Add the flour mixture to the mixing bowl alternately with the Coca-Cola mixture, starting and ending with flour. Fold in mini marshmallows and maraschino cherries. Pour into a greased and floured 9x13 inch pan. Bake at 350 degrees for 30-35 minutes, or until a toothpick inserted near center comes out clean. Allow cake to cool for 10 minutes, then pour the glaze over the hot cake. In a medium saucepan, bring the butter, Cherry Coca-Cola, and cocoa powder to just a boil. Remove from heat, and whisk in powdered sugar and vanilla. Pour over the hot cake. 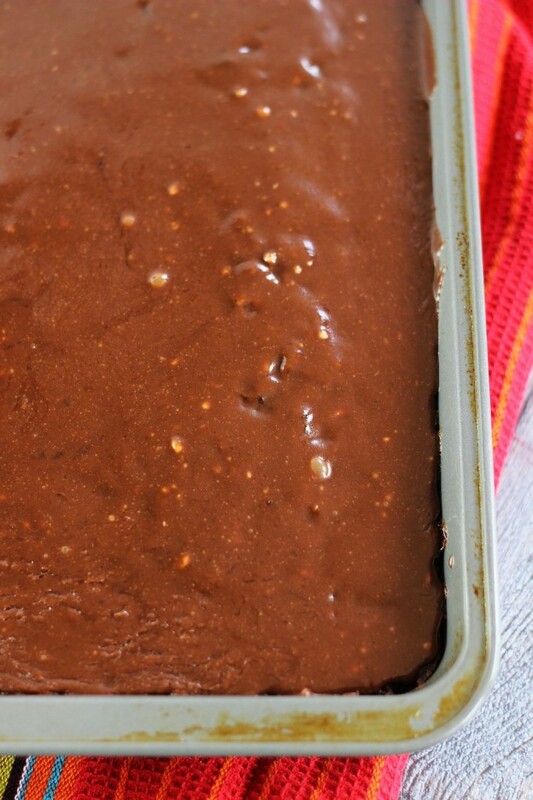 Sprinkle the cake with toasted pecans. Allow to cool completely. 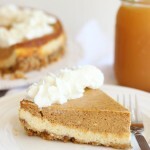 Double Layer Pumpkin Cheesecake – 2 ways! Part 1 – The Traditional. This looks so good Sarah!! Pinned! Thank you so much, Claire!! Love this! And I love those cute little 4-packs — so perfect for mixing and matching! That cake looks delicious Sarah! Love the nuts on top! Love this recipe. That cake looks SO chocolatey and moist! YUM! Yes!! It’s gooey and wonderful! Thank you, Blair! So I’m so not a basketball fan, but I’m in love with coke! I would die for this cake. I think I need to make it and just tell my hubby we care celebrating something even if its to say we are watching basketball, football or soccer. I don’t care as long as I can have a slice of this delicious cake. Hehe. Pinned!! This cake is totally a slam dunk! Looks so decadent and delicious and the cherry coke sounds awesome in here!